“Do you want to be happy? Do you want to be free?” Those are the first words spoken from J. Cole on his newest album 2014 Forest Hills Drive. With the state of America and the war that is being fought with the “justice system” and people of color, this album could not have dropped at a more proper time. Mike Brown, Eric Garner, Trayvon Martin, Jordan Davis and thousands more that were unjustly killed this year and the millions more that were unjustly killed throughout time have a voice(s). One of those voices belongs to Jermaine Cole. J. Cole’s intro’s to all of his projects have been harmonic and has brought most listeners in with a meaningful message and the streak has not been broken. Freedom is the theme aimed toward everyone but specifically for people in lower income neighborhoods, violence, drug and gang wars (black people). The album follows up with the date of Cole’s birth “January 28th,” that brings you into a minuscule timeline of his life. This track contrasts him from everyone else (past or present) in the game that points out one simple fact, they aren’t him. 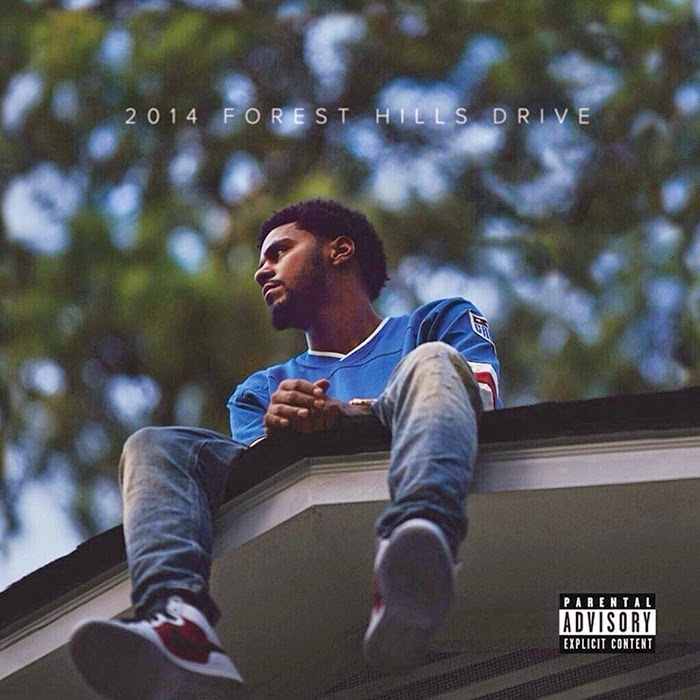 What has already become one of the most controversial tracks of 2014, “Fire Squad” has become a fan favorite from the album simply for the truthful joke that J. Cole told. I don’t believe Cole was aiming for anyone’s neck but he has a valid and sound point. All of the artists named are accredited with prestigious contributions, titles and awards that they themselves did not create, hence “White people have snatched the sound.” “Fire Squad” definitely does not disappoint. Following up with Born Sinner’s “Runaway” is “Hello.” If you can remember, “Runaway” aired out what it is like to be a (typical) male in modern day. While wanting to love the woman you can’t live without, but still wanting to be young and free to sew your oats is the mind state that not only Cole has, but others and he perfects the words. What follows up with the wrong choices of being a Rolling Stone is “Hello.” This track cuts deep with Jermaine in the future and is reminiscing to the one he loved as he finds out that she has given birth to her second child that isn’t by him. While pondering about this woman and how he thought they would be together forever, he has to let her go. A timeless album is what we got with very short notice from the North Carolina bred rapper. Touching on so many issues in urban communities, J. Cole tells even more stories that anyone from these environments can relate to. This album is strictly for the people. No features, no radio tracks (in my opinion), just him. From the production to lyrics J. Cole was involved and delivered his all. A classic in my book and definitely a candidate for Album of the year, but there are others that will definitely disagree. Regardless of your position this is definitely worth the purchase. Below is a video for J. Cole's "Intro"
…There are too many killings of black men/youth going on in the United States by those who swore an oath to serve & protect its citizens. Stand up for what’s right, these modern day lynchings have been going on across the nation and it won’t stop until we unite as a people. It’s sickening that this is happening in this day and age, J. Cole knows it and this album bears a mark that I hope will inspire. Rest In Peace Mike Brown, Jordan Davis, Eric Garner, Trayvon Martin, Tamir Rice and the countless others that lost their lives due to injustice.